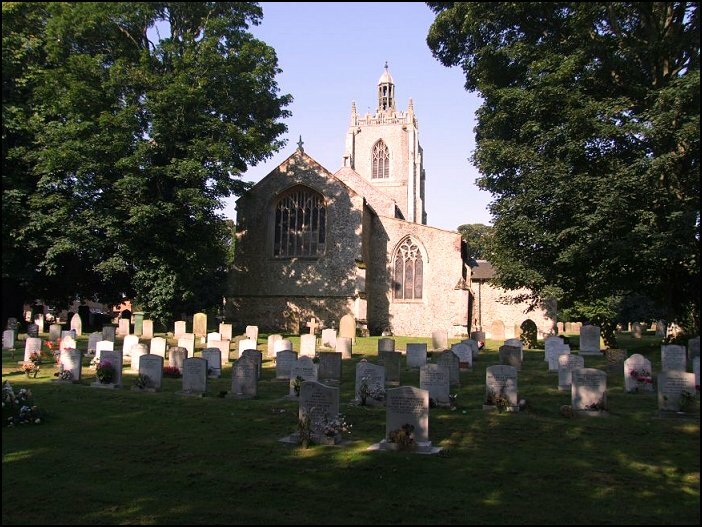 It seems odd to describe Necton as a commuter village for Swaffham, but that is what it appears to be, and its considerable size gives it a bit of life. And, the support for a decent pub, which we invaded and took up most of one of the bars. It also has a huge church, set in a wide graveyard, so that the suburban setting doesn't overwhelm it. The tower is massive, and perfectly articulate in its Perpendicular language. 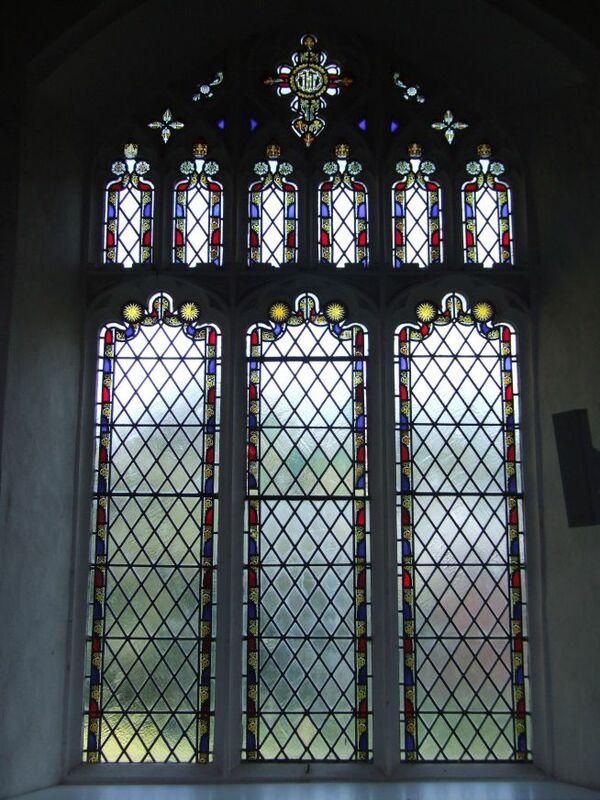 And so it should be, as it is entirely the product of the 1870s Gothic revival. I thought it the most convincing example of Victorian gothic I had seen in East Anglia, not excluding the tower of Long Melford, and guessed it must have been very expensive. The sanctus bell turret at the other end of the nave may be original, but is unlikely to be so under the circumstances. It remded me very much of the one at Fressingfield in Suffolk. We were all fortified by our hearty lunch, and perhaps happy to stroll about in the fresh air pondering the provenance of a vast stone coffin lid that has been placed on a tombchest in the graveyard. But the pleasant churchwarden came with the key, and so we all piled inside. 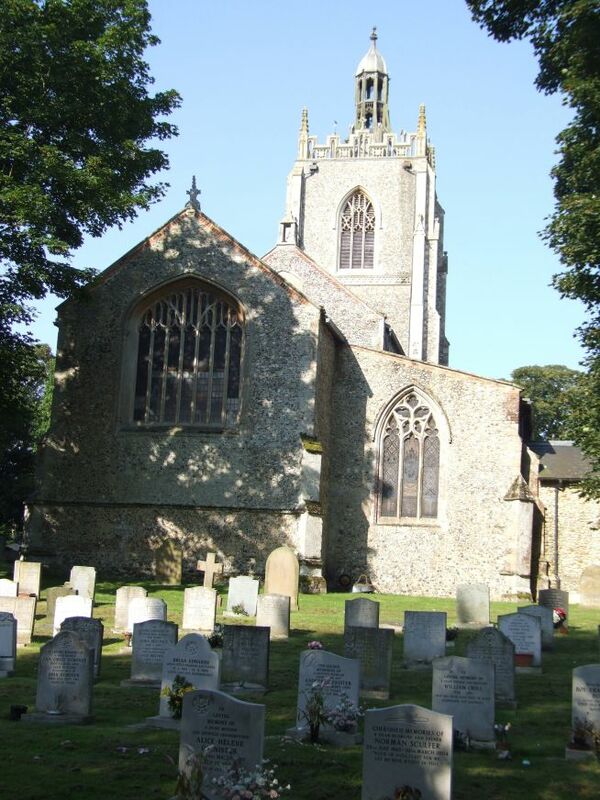 Necton is exactly the kind of vast church I used to be sniffy about. Although it is not without lots of medieval survivals, the whole lot has been restored so extensively and with such good taste that the building speaks more of the aesthetics of 19th and 20th century Anglican triumphalism than it does of its remote past. It is as if everything before, say, 1870 has been tamed and transformed, pushed into the service of the Anglican project. 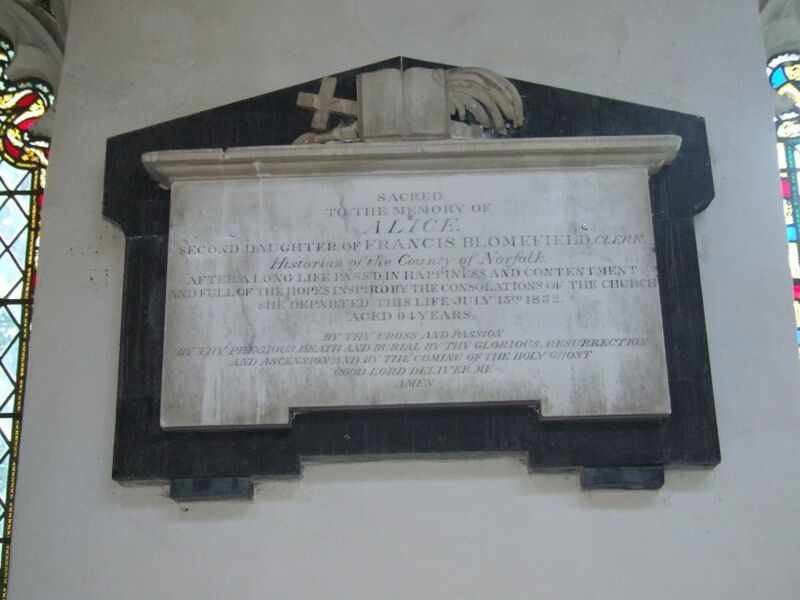 Now I see reason for this not to happen, for as Terence Smith says of Bradfield St Clare in Suffolk, to look into this church today is to look into a mirror of the Church of England. Here are almost the last vestiges of the Old Faith cleared away, and the depredations of the Puritans made good - decent at least. It is like looking into the face of the Elizabethan settlement. And a better description hasn't been written of a uniquely Anglican aesthetic that I have read. 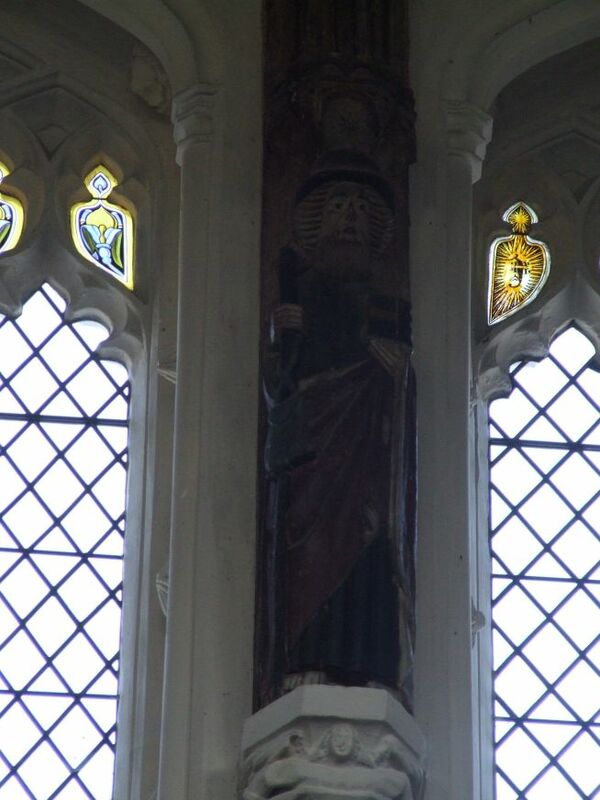 The triumph in the mix here is the view upwards and eastwards; a typical East Anglian angel hammerbeam roof in all its painted glory, with Saints in the pedestals and angels on the beam ends, leads the eye to the window that backlit the rood in Catholic days. 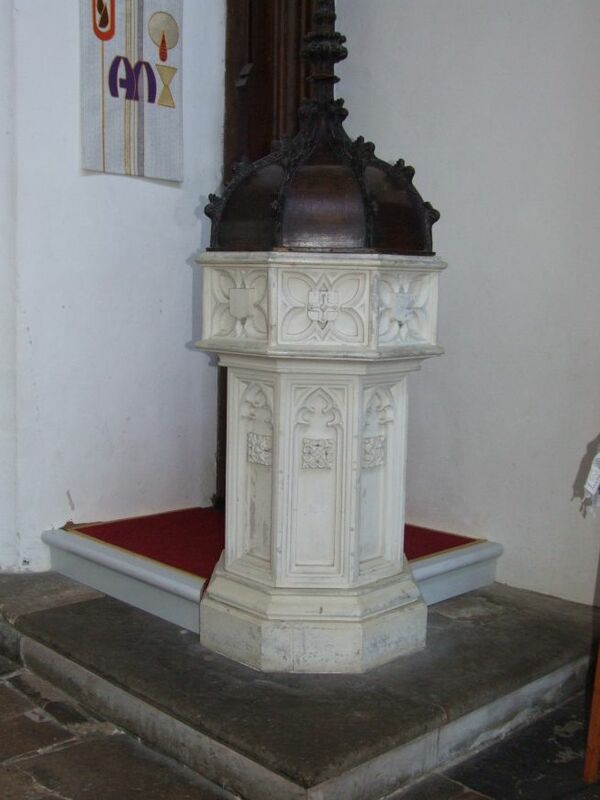 This is similar to the one at nearby Beeston, but this one has now filled in, and is very curious; a central pedestal is empty, but flanking niches hold four figures. 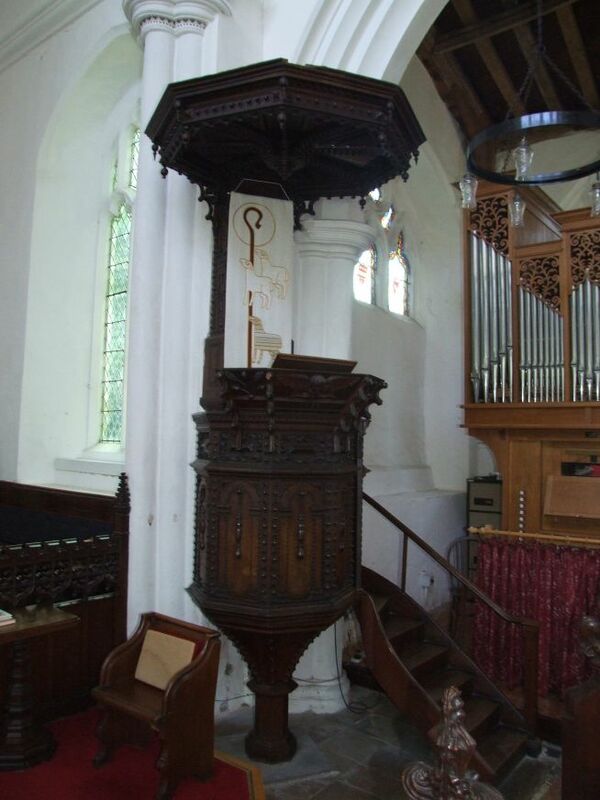 Now, Mortlock suggests that the pedestal once held a Christ in Glory, but I do not think this can be right. 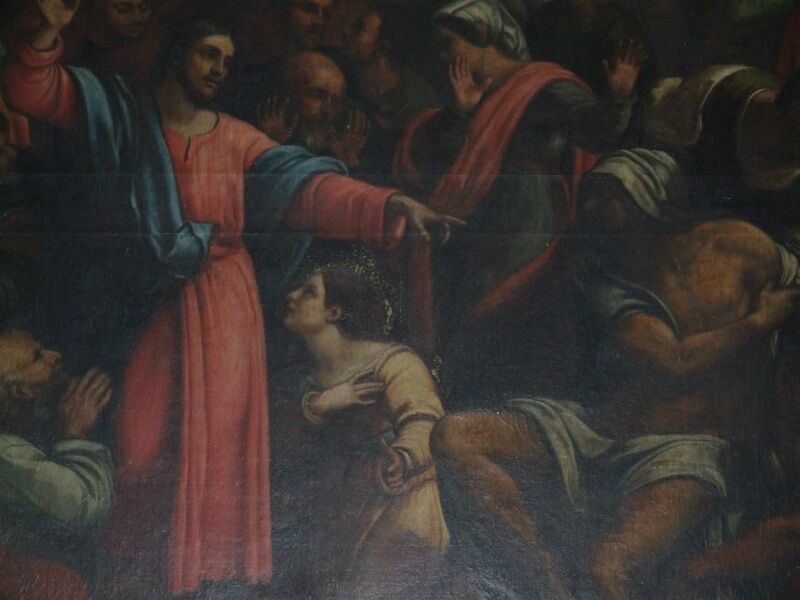 Perhaps it held the crucifix, and the lower two flanking figures were Mary and John. But the more I looked at it, the more I became convinced that the whole thing is a Victorian confection. 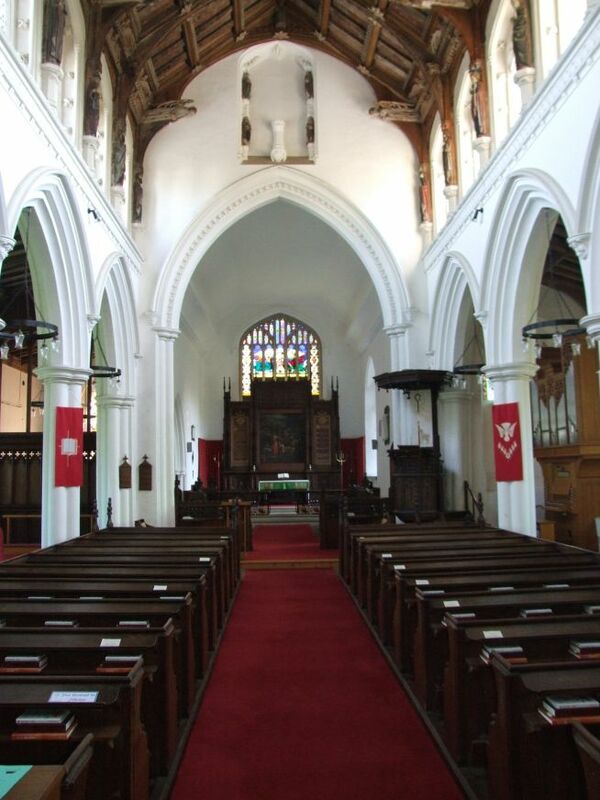 And the chancel arch, too, I think is Victorian. You'd even think that perhaps there never was a window at all, if it wasn't for the fact you can see it from the outside as well. 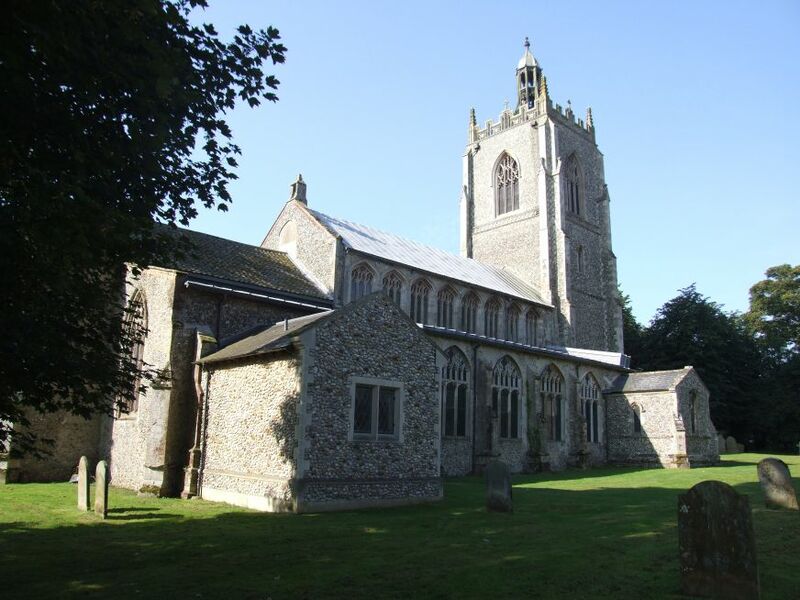 I came back to Necton for the first time some four years later, in the summer of 2007. All Saints was waiting, as stately and magnificent as it had been before, as triumphant as Anglicanism was when its glory was restored. 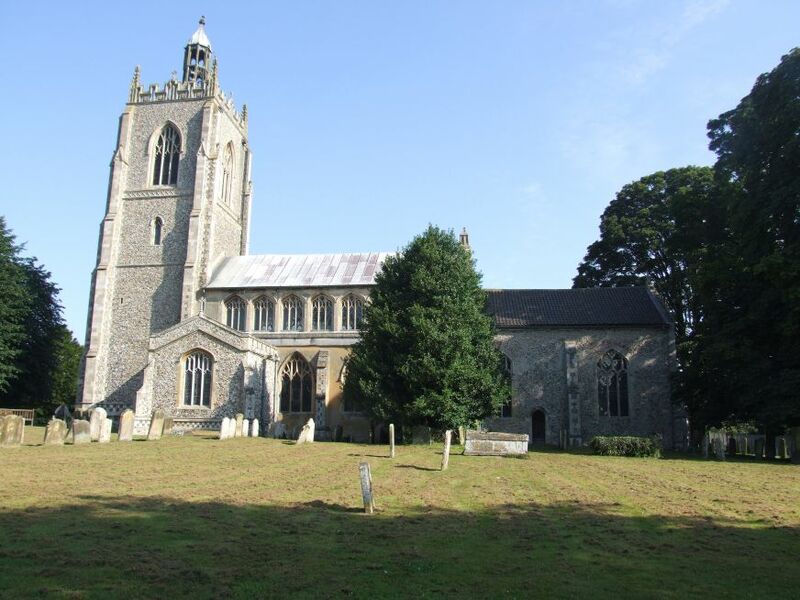 These days, the parish keep the church open in daylight hours, and so you can step straight into the great west door under the tower - All Saints is one of the few Norfolk churches which have no way in from south or north, the two porches having been converted into a chapel and a vestry respectively. You step through this space into the well-kept vastness, a harmonious interior that is at once vernacular and urban. 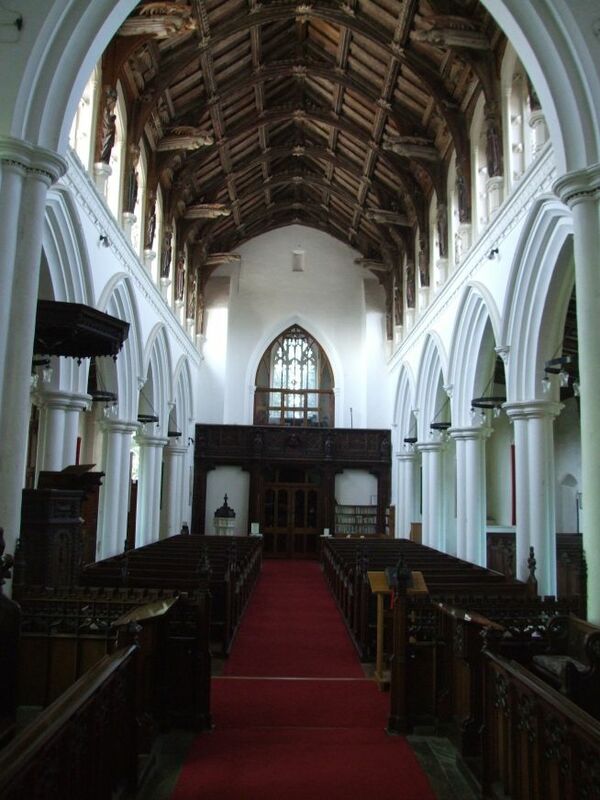 The great angel roof, one of Norfolk's best, gazes down in mute gloriousness. 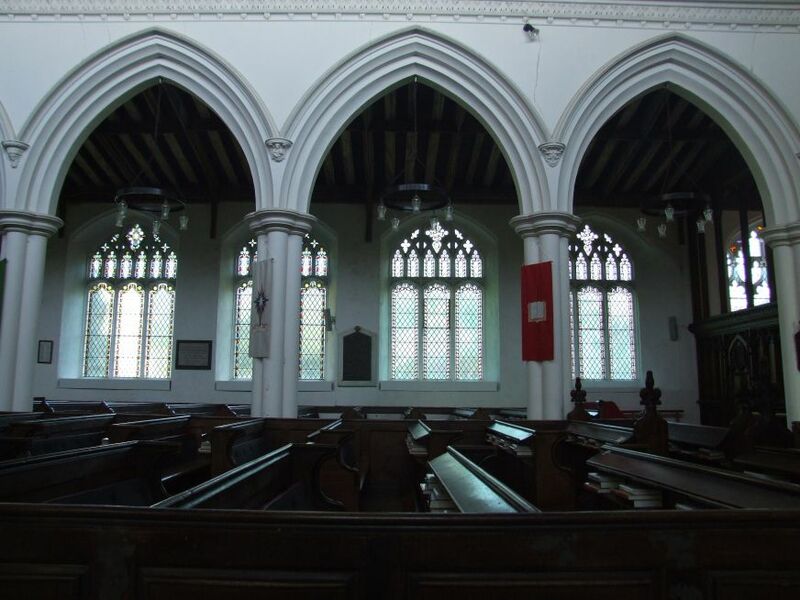 The interior works as a whole, but with plenty of little details to hunt down - the green man on one of the clerestory corbels, brass figures in the nave and chancel, a tiny brass inscription under the bookshelves, and so on. 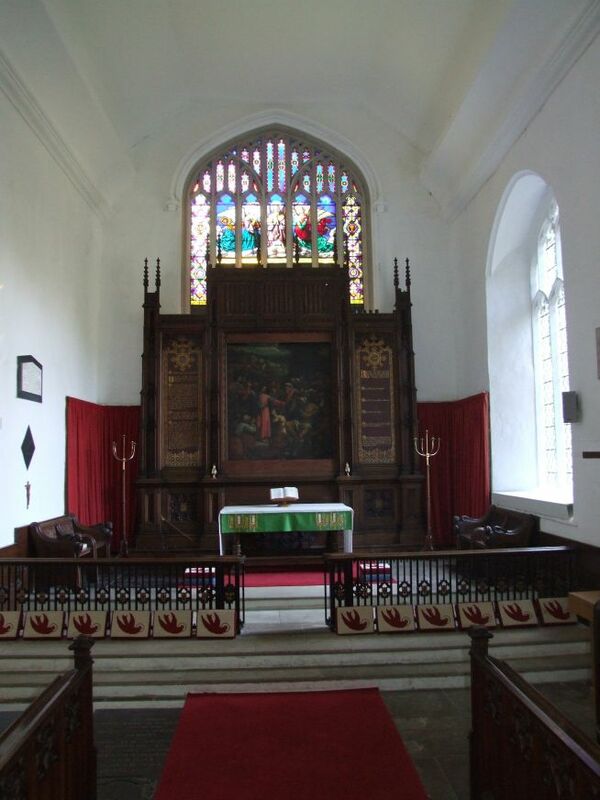 The chancel is unfamiliar, the great reredos rising to a short window, the effect almost baroque. 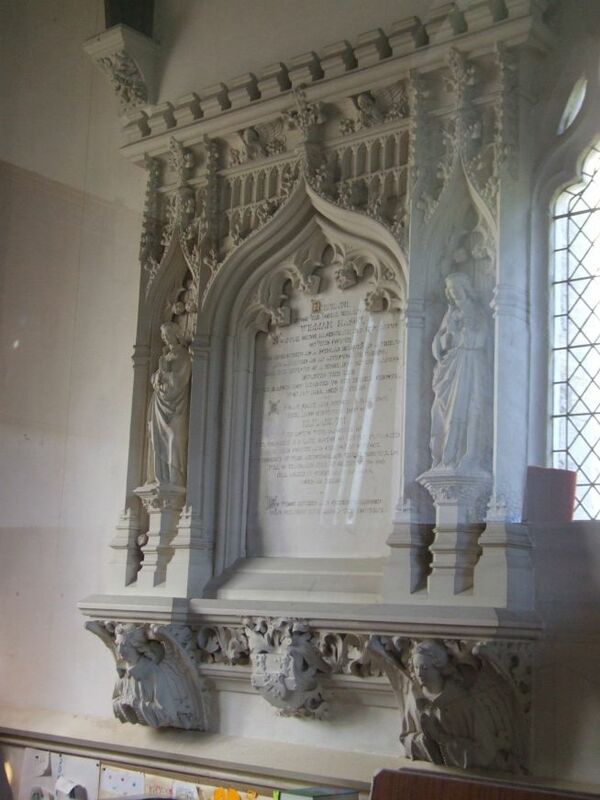 One of the great curiosities of Necton is the pair of monuments in the south chapel. These are early 19th century, and are to members of the Mason family. Despite the date of 1835, they are in the full, articulate flow of the Ecclesiological revival, and this is because they are by Pugin, founder of the feast. Unfortunately, the chapel itself is kept locked, and so you can only see them through the grill.